The Outer Banks Flotilla of the Coast Guard Auxiliary recently welcomed a new vessel into its fleet. The Salty Dog, owned by John Lawing and maintained out of Heritage Point on Roanoke Island, becomes the Flotilla’s 7th authorized vessel. 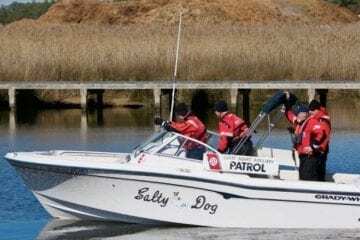 Salty Dog will join her sister vessels supporting a wide range of activities including aircraft and helicopter search & rescue training, training with the Oregon Inlet Coast Guard boat station, and conducting local boating safety patrols during the busy boating season. The Outer Banks Auxiliary Flotilla is among the busiest in the country in providing vital support to ensure active duty Coast Guard readiness. The groups 50+ volunteer members are also very visible in the community, spreading the message of boating safety through boater certification training, vessel inspections, children’s programs, and liaison with other first responder organizations. If you are passionate about boating and have a desire to enhance community enjoyment of our unparalleled water resources, we welcome you to learn more by contacting our Human Resources Officer Jay Dunlap (jay.obx@gmail.com). We also welcome you to attend one of our monthly meetings held the 4th Wednesday of every month at 7PM at the Pitt Center in Southern Shores.